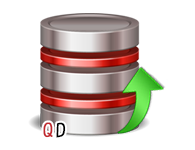 An independent SQL MDF Extractor Pro for the extarction of data from MDF file with other data items like rules, keys, functions, columns, stored procedures, etc. are also processed with this software application. SQL MDF Extractor Pro is an eminent software to extract all functions, tables, rules, stored procedures, views, triggers including all data types, primary key, unique keys. In case you have deleted few of the tables or any other data from the database.Then also you can easily extract that deleted data with this tool. The modes of scanning are provided on the basis of requirement. Quick Scan - For normal corrupted MDF file, Advance Scan - For more corrupted data file. It is not fix that you have to extract the entire data, if you need less.Since, options are provided to select the particular data you wnat to extract. Step 1: Download and Start SQL MDF Extractor Pro. Step 2: Select any one scanning option. Choose Auto Detect Database File. Step 3: Select radio button as per your requirement and click OK. Step 5: The tool will show a notification, if you want to save the scanned data. Is it possible to extract multiple MDF files from a database? Yes, the tool supports multiple MDF files of a database. Does the Tool Support SQL Server 2016 version? Yes, the tool capable enough to work on latest SQL Server 2016 version. Quickdata SQL MDF Extractor Pro software offers an exact solution for extracting data from MDF as well as NDF files. The best part of the tool is that it helps in restoring exrtacted data to SQL Compatible scripts in the absence of live SQL Server environment. As a DBA, my primary concern was to extract tables in SQL 2008 version present in a large volume database but I was not in a situation to make compromises with the integrity of the tables. SQL MDF Extractor Pro tool helped me in extracting corrupted tables and saved the data in original structure.